Looking for the best Cross Country Skiing trails around Burlington? Find the top rated cross country skiing trails in Burlington, whether you're looking for an easy short cross country skiing trail or a long cross country skiing trail, you'll find what you're looking for. Click on a cross country skiing trail below to find trail descriptions, trail maps, photos, and reviews. The trail is quite flat and the scenery is lovely, so for those two key elements it is an excellent trail. But the surface condition is so bad that it detracts from the enjoyment. It would take very little effort to correct most of these problems. Maintenance on this county trail seems to entail throwing down piles of loose gravel. Even the widest tires will sink into loose pea gravel with no stone dust, so you have to be constantly alert to these wide areas. It doesn't help that these areas occur more frequently at road crossings. Also, the barricades at road crossings are unneccessarily enormous and positioned in a way that you cannot easily get around them. riding around the outside can be done at alot of them, but it's not consistent. The barricades could be unlocked and opened just a little more so a cyclist could ride through, while still blocking road traffic. As it is, there are too many crossings to have to stop and walk through 2 of these at every side street. The area at mile 4.8, near Minker Creek, is abominable. The ladt straw for us was how rough the trail got as we approached Hamilton. We finally gave up and turned around before we got to town. We typically ride 12 to 14 mph on good stone trails, but we were reduced to 8 mph for this trail. 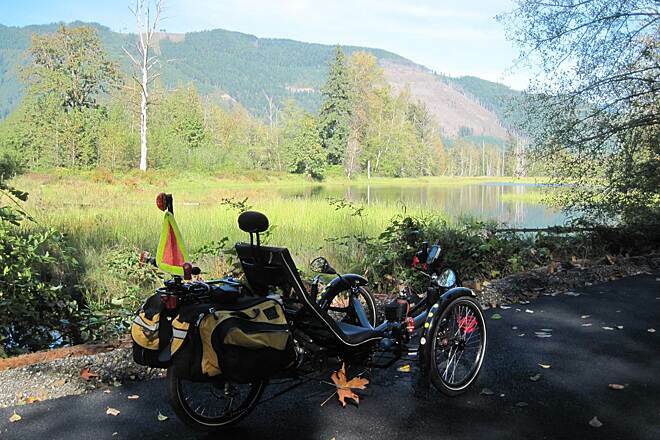 We began our 20 mile out-and-back ride at a small parking lot near Gehrke and Wild Current Rds near MM20 in Sequim. The parking lot had space for about five cars. We headed west towards Port Angeles. The first five miles of the trail, which is heavily wooded, was very narrow with sharp, blind curves with a lot of up-and-downs. You would gain some speed on a downhill section only to have to brake because of the narrowness and curviness of the trail and the uncertainty of what was in the opposite direction. This section would not be considered a “rails-to-trail” type of trail. 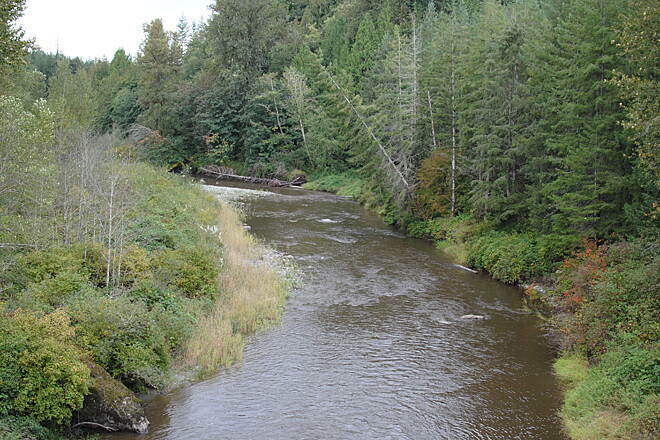 Once we crossed the Morse Creek Trestle Bridge, the trail widened with views of the strait. This five-mile section into Port Angeles was the nicest section. We stopped near the Marine Center before turning around. 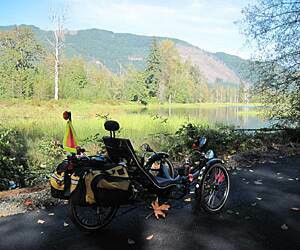 If I were to do this ride again, I would park at the Deer Park Trailhead and cycle into Port Angeles and perhaps check out the path along Ediz Hook. There was nothing of interest for the first five miles to warrant cycling that section again unless you were doing it for the mileage or were traveling the entire trail. There were two port-a-potties along the route and no other amenities. 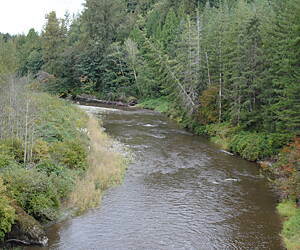 We began our out-and-back 20 mile ride at the Jamestown S-Klallam Tribal Headquarters off of Old Blyn Highway. There is parking in back of the library or you can park in one of the parking lots at the tribal headquarters. 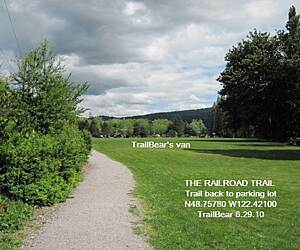 You’ll find bathrooms at the trailhead. The trail, for the most part, was in very good condition. It varied from narrow and winding to wide and straight. 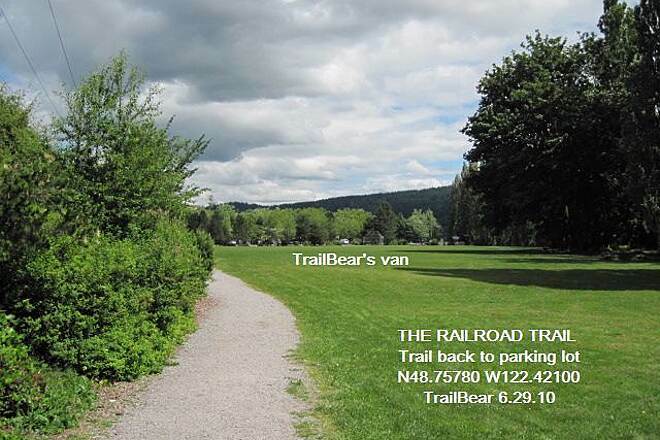 At some points, the trail ran parallel to highway 101 but was often buffered by trees. There is a short section at the beginning of the ride that is on a very lightly traveled road. There are some easy road crossing along the trail. The ride into Sequim was along Washington Street/Avenue with a short segment on the street before arriving at Carrie Blake Park where we turned around. The tourist bureau is just at the turnoff for Carrie Blake Park. 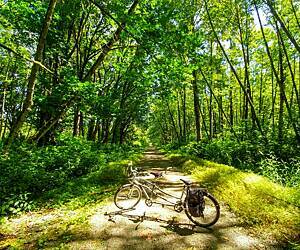 The park in Sequim is a good stop for lunch or, if you prefer, Sequim Bay State Park is another option. 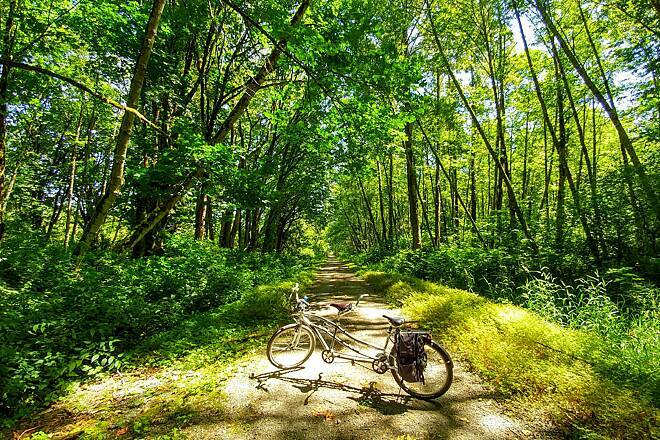 We would recommend this section of the trail.